Every day, more than 11,000 United Nations police officers from 88 countries foster international peace and security by supporting countries in conflict, post-conflict and crisis situations. They reinforce and re-establish security by patrolling communities, advising domestic police services, increasing compliance with international human rights standards, and restoring and promoting public safety and the rule of law. An integral element of United Nations Peace Operations, United Nations Police contribute to the full peace continuum. The breakdown of law and order often triggers United Nations deployments and, conversely, the (re)establishment of the rule of law contributes to long-term stability and allows United Nations peace operations to eventually withdraw. UN police officers support effective, efficient, representative, responsive and accountable police services that serve and protect the population. United Nations Police (UNPOL) builds and supports host-State police capacity to prevent and detect crime, protect life and property and maintain public order and safety in adherence to the rule of law and international human rights norms. 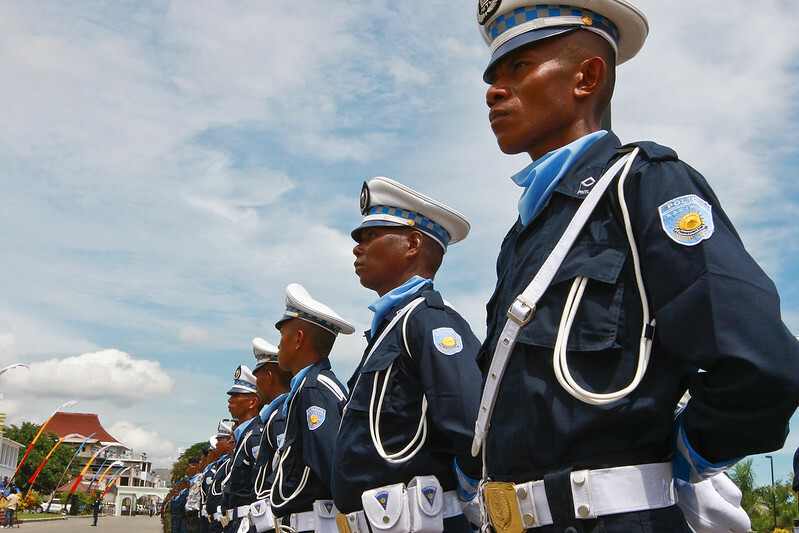 All UNPOL personnel working under the Blue Beret are active members of their home police services seconded to work with the United Nations. “Specialized policing assistance, as part of the conflict prevention toolbox, can help avoid the need for larger-scale interventions down the road”, said UN Secretary-General in the lead up to the second United Nations Chiefs of Police Summit (UNCOPS) in Jun 2018. 129 countries have seconded female and male police officers to serve the United Nations Police since 1990. 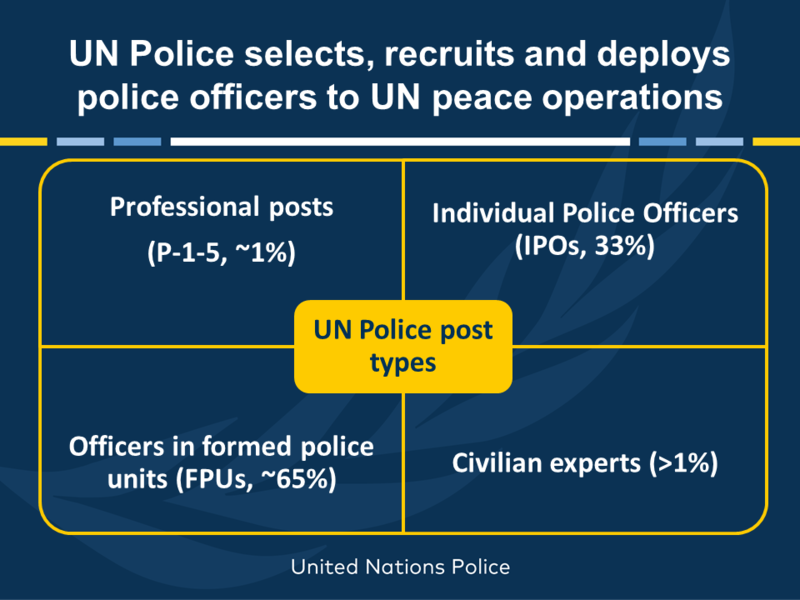 More than 11,000 United Nations police officers are deployed in 15 United Nations peace operations, namely, MCOLOMBIA, MINURSO, MINUSCA, MINUJUSTH, MINUSMA, MONUSCO, UNAMA, UNAMID, UNFICYP, UNISFA, UNMIK, UNIOGBIS, UNMISS, UNSMIL and UNSOM. The United Nations has been deploying police officers for service in peace operations since the 1960s. ONUC was the very first United Nations mission where United Nations Police were deployed. 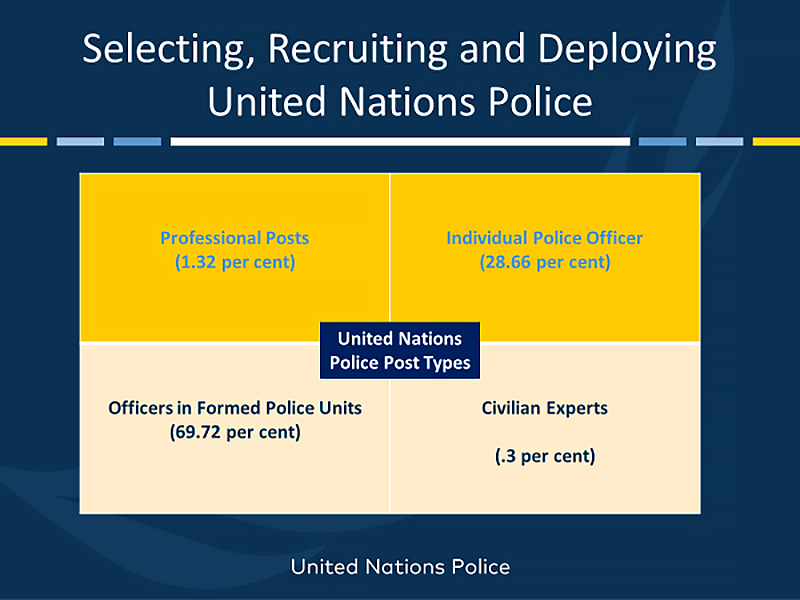 The number of United Nations Police officers authorized for deployment in peacekeeping operations and special political missions increased from 5,840 in 1995 to over 11,000 in 2018. On any given day, United Nations police are providing operational support to host-State counterparts including to protect civilians; help facilitate secure elections; investigate incidents of sexual and gender-based violence; or prevent and address serious organized crime and violent. United Nations Police also assist with the reform, restructuring and development of host-State police services and other law enforcement agencies. Does United Nations Police have a standing police service? The United Nations Standing Police Capacity is the rapidly deployable operational wing of the United Nations Police Division, comprising 37 experts, based in Brindisi, Italy, tasked with providing the start-up capability for the police components of new United Nations peace operations, along with providing advice, expertise and assistance in the field of institutional law enforcement capacity building. The second task has, over time, evolved in line with the requirements of the United Nations system, as recognized in Security Council resolution 2382 (2017), which welcomed the support of the Standing Police Capacity to other United Nations entities through the Global Focal Point for Police, Justice and Corrections arrangement, as well as its work in providing rapid, coherent, effective and responsive start-up and assistance capability for police components in peace operations. The United Nations Police Division seeks highly qualified police officers from United Nations Member States for service in UN peace missions around the world. UN police officers are authorized by voted resolutions of the Security Council to serve in peacekeeping operations to implement the mandated policing tasks. They are composed of formed police units (currently 69.72 per cent), individual police officers (currently 34 per cent), which include specialized teams, contracted seconded police and civilian experts. Find out more information on how to be nominated and serve with United Nations Police. In line with United Nations Security Council Resolution 1325 (2000) which recognizes the importance of women’s participation in United Nations field-based operations, and Resolution 2242 (2015) which calls for the doubling of the number of uniformed women personnel by 2020, the United Nations Police Division has undertaken several measures that have resulted in a noticeable increase in the deployment of women police officers to field missions. Over the course of the last decade, the number of women Individual Police Officers (IPOs) and the number of women police officers embedded in Formed Police Units (FPUs) has tripled. Currently, of the 10, 683 police personnel serving in 14 peace operations, 1,198 are women. This includes 606 Individual Police Officers and 592 members of Formed Police Units. Altogether, women police officers comprise approximately 11 percent of the police components. Notwithstanding the low overall proportion of women police personnel, the UN Police Division has made significant progress in recruiting senior women police officers in leadership positions. Of the 10 peacekeeping missions with a police presence, police components of four missions are now headed by a woman police officer (40%). 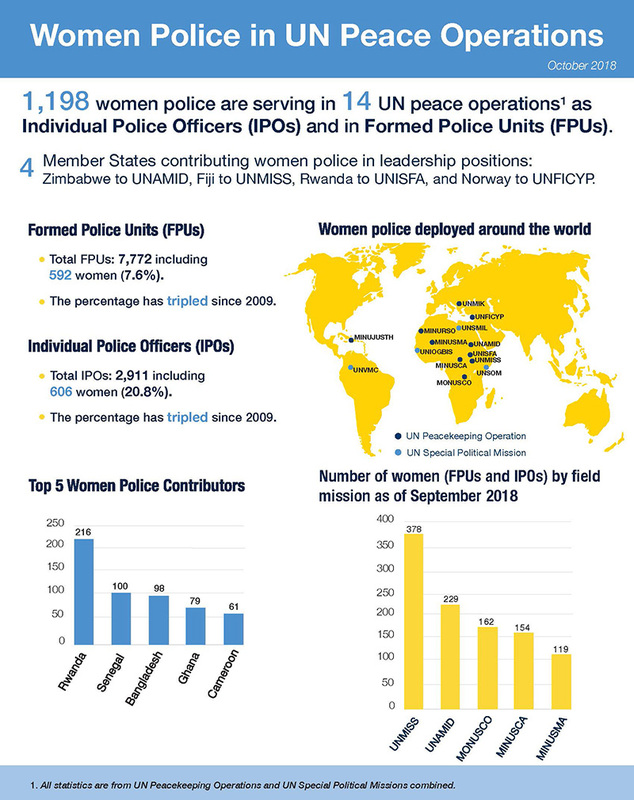 The United Nations Police Division remains committed to prioritizing recruitment, deployment, and retention of women police officers in peacekeeping operations at all levels. Women police officers play a critical role in promoting peace and security, including through public order management activities, specialized capabilities such as Special Weapons and Tactics (SWAT) and participation in high-risk operations. Women police officers are indispensable during high-visibility patrols, cordon and search operations, and during pat-down searches. In some instances, only women police officers can interact with women and girls in the communities and such engagements inform the protection strategies of the United Nations, thus ensuring that the needs and perspectives of those who are at risk the most are taken into consideration and addressed. In conflict and post-conflict situations where sexual and gender-based violence is likely to be rampant and possibly used as a tactic to achieve strategic or political objectives, survivors and members of the community are more likely to approach women police officers. Thus, women police officers play a crucial role in operations, monitoring and reporting of violations, addressing impunity, and promoting accountability leading to enhanced rule of law, recovery and reconciliation. To increase the recruitment and deployment of women Individual Police Officers in UN field missions, in 2014 the UN Police Division launched a training initiative that imparted women police officers with tools and skills required for the assessment for mission service – a pre-requisite for deployment to field missions. As part of this training initiative, over 900 women police officers in nine countries were evaluated and trained and constitute a third of all field mission deployments. From December 2017 onwards, the UN Police Division conducted three command development courses for senior women police officers to prepare and equip them for senior leadership positions. Over 140 women police officers representing 52-member states have been trained and form an elite cadre of officers ready for deployment. In October 2018, the UN Police Division also organized a course for UN Police Gender Advisers in Uganda with 35 participants representing 21 Member States. In 2018, building upon the United Nations Secretary-General’s System-Wide Gender Parity Strategy, the Department of Peace Operations developed a Uniformed Personnel Gender Parity Strategy with clear objectives, targets, and benchmarks along with reporting and monitoring mechanisms to achieve appropriate gender balance. 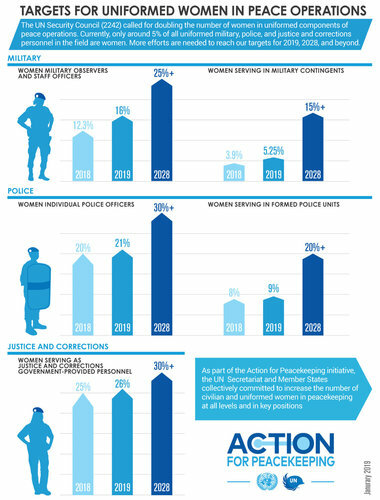 Under this strategy, by the year 2028, the UN Police Division is committed to recruiting at least 30% women police officers in professional positions in the field (20% in Formed Police Units and 30% as Individual Police Officers) and 35% in UN Headquarters. To achieve these goals, the UN Police Division will continue to engage Member States and seek the support of gender champion countries such as Rwanda and Senegal – the two largest women police contributors. Currently, the United Nations Mission in South Sudan (UNMISS) has the largest combined deployment of women police personnel, followed by UNAMID (Sudan); MONUSCO (DRC); MINUSCA (Central African Republic); and MINUSMA (Mali), respectively. The UN Police Division will also continue to identify opportunities for women police officers in these missions, while ensure that gender perspectives are mainstreamed in all policing activities and equal opportunities are afforded to women in police at all levels. Since 2011, every year one serving United Nations Police Officer receives the United Nations Female Police Officer of the Year Award, formerly known as the United Nations International Female Police Peacekeeper Award. The award is given to an outstanding women police peacekeeper serving in a United Nations peace operation. The United Nations Police, in conjunction with mission components, United Nations partners and others, including the African Union, the European Union, the Organisation de la Francophonie, INTERPOL, and the International Association of Chiefs of Police, strengthens rule of law capacities and supports security and justice sector reform in host States, in line with International Guidance Framework for International Police Peacekeeping – SGF. This support reinforces national, regional and international efforts to disrupt criminal networks and address key drivers of conflict and violence, as well as social injustice and inequality. UNPOL is part of the Global Focal Point for Police, Justice and Corrections arrangement, which allows the delivery of UN policing expertise in collaboration with other UN entities for effective conflict prevention, , rule-of-law bound peacekeeping and sustainable peacebuilding in both mission and non-mission settings worldwide. “I strongly believe that the Global Focal Point for Police, Justice and Corrections arrangement has become a new, indispensable, and system-wide delivery platform”, Alexandre Zouev, Assistant Secretary-General for Rule of Law and Security Institutions. For more information visit the website of United Nations Police (UNPOL). Priscilla Makotose "policing is a matter of attitude and commitment"